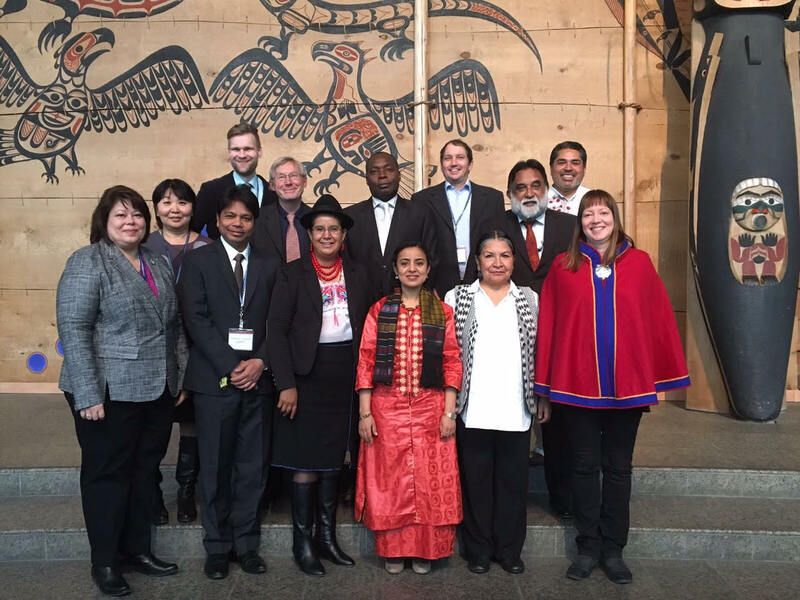 United Nations, 6 March 2017 – In preparation for the 16th Session of the UN Permanent Forum on Indigenous Issues which will commemorate the 10th anniversary of the UN Declaration on the Rights of Indigenous Peoples, the expert members of the Permanent Forum gathered in Ottawa from 27 February to 3 March, in a pre-sessional meeting hosted by the Government of Canada. The experts met with First Nations, Métis and Inuit representatives as well as government officials and parliamentarians to strategize on advancing the rights of Indigenous Peoples. During the meetings, representatives of the Assembly of First Nations, the Native Women’s Association of Canada, the Congress of Aboriginal Peoples, the Inuit Tapiriit Kanatami and the Métis National Council expressed their willingness to work with the Government of Canada to further the implementation of the UN Declaration on the Rights of Indigenous Peoples. Members of the Permanent Forum welcomed the commitment of Prime Minister Justin Trudeau to prioritize Canada’s nation-to-nation relationship with Indigenous Peoples, as well as his unequivocal support to the UN Declaration on the Rights of Indigenous Peoples announced in May 2016. The experts also expressed support for the recent announcement by Canada to establish a Working Group of Ministers to review relevant federal laws, policies, and operational practices to ensure alignment with international human rights standards, including the United Nations Declaration on the Rights of Indigenous Peoples. The Acting Chairperson of the Permanent Forum, Ms. Mariam Wallet, stressed the importance of this review being carried out with the full participation of and in consultation with the First Nations, Métis and Inuit, and invited the Government of Canada to share their experience in undertaking this historic task at the annual session of the Permanent Forum in April-May this year. The 16th Session of the Permanent Forum on Indigenous Issues will take place from 24 April to 5 May 2017 at United Nations Headquarters in New York. More than 1,500 participants are expected to attend the session, which will focus on the advancements in the implementation of the UN Declaration on the Rights of Indigenous Peoples, the follow-up to the 2014 World Conference on Indigenous Peoples, and the critical situation of indigenous human rights defenders. There will further be a special focus on indigenous women and youth. The session will also mark the ten-year anniversary of the adoption of the UN Declaration on the Rights of Indigenous Peoples, which is increasingly recognized as the normative framework to address historical injustices and ensure that Indigenous Peoples are included as partners in finding solutions to the global social, economic and environmental challenges that humanity is facing. The Permanent Forum on Indigenous Issues consists of sixteen members, serving in their personal capacity, for a term of three years. Eight members are nominated by Governments and elected by the UN Economic and Social Council, and eight are nominated by indigenous organizations and appointed by the President of the Council. Twelve new experts joined the Permanent Forum on 1 January 2017: Mr. Les Malezer (Australia), Mr. Jens Dahl (Denmark), Ms. Lourdes Tibán Guala (Ecuador), Ms. Anne Nuorgam (Finland), Mr. Seyed Moshen Emadi (Iran), Mr. Jesus Guadalupe Fuentes Blanco (México), Mr. Phoolman Chaudhary (Nepal), Ms. Tarcila Rivera Zea (Peru), Mr. Dimitri Zaitcev (Russian Federation), Mr. Elifuraha Laltaika (United Republic of Tanzania), Ms. Terri Henry (United States of America) and Mr. Brian Keane (United States of America). Mr. Gervais Nzoa (Cameroon), Ms. Mariam Wallet Aboubakrine (Mali) and Ms. Aisa Mukabenova (Russian Federation) are continuing in a second term. One expert member seat is yet to be filled. More information about the United Nations Permanent Forum on Indigenous Issues and the upcoming 16th Session of the Permanent Forum is available at www.un.org/indigenous.